Hello out there. 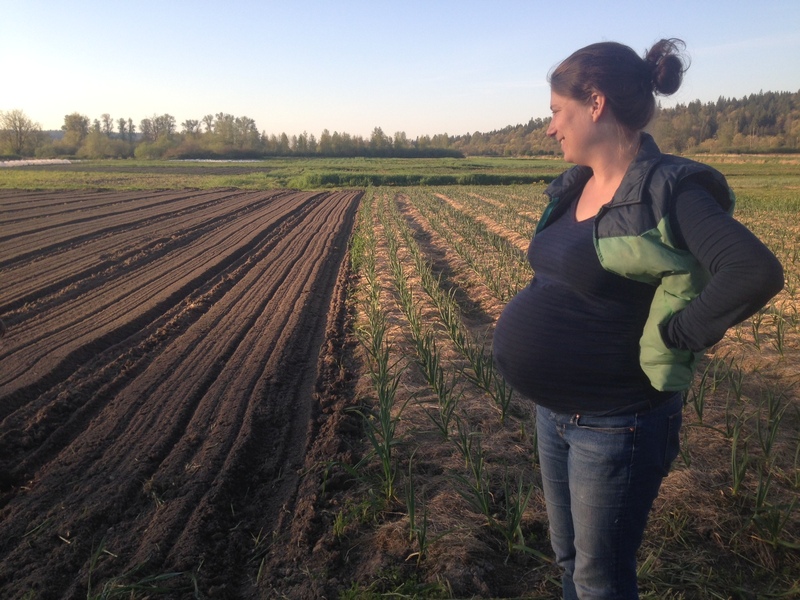 It seems we’ve been a little busy since last we posted in late April: spring planting, the start to our market and CSA season… oh yeah, and we had a baby too. 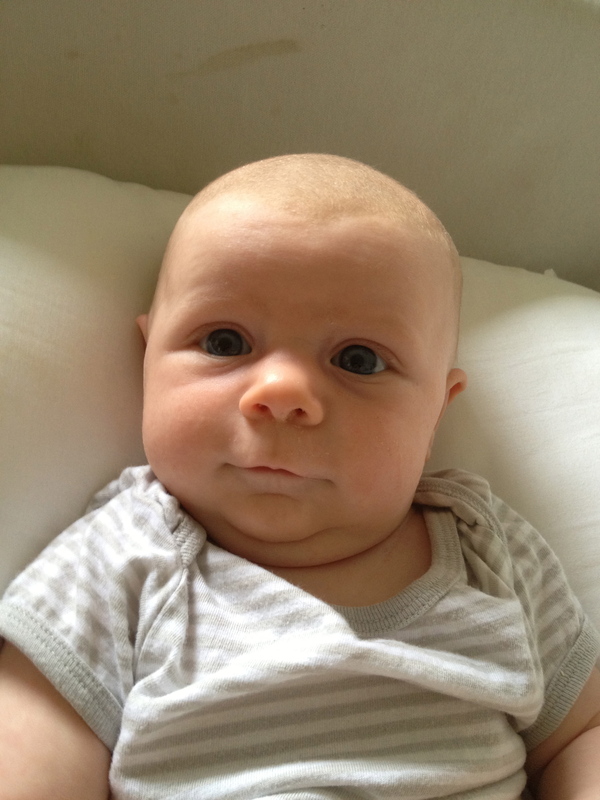 Baby Beatrice was born thirteen days past her due date, on May 7th. 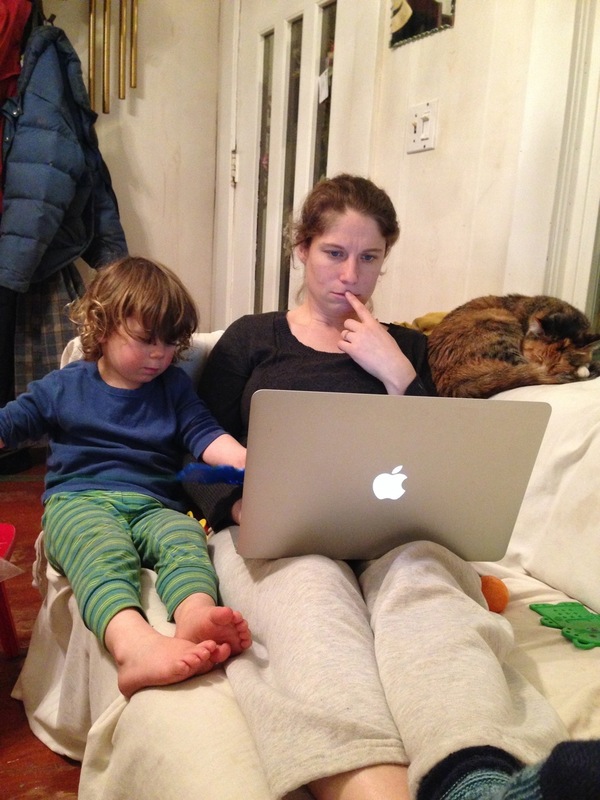 While the difference of two weeks might not seem like a lot, during the spring crunch time every day is precious. 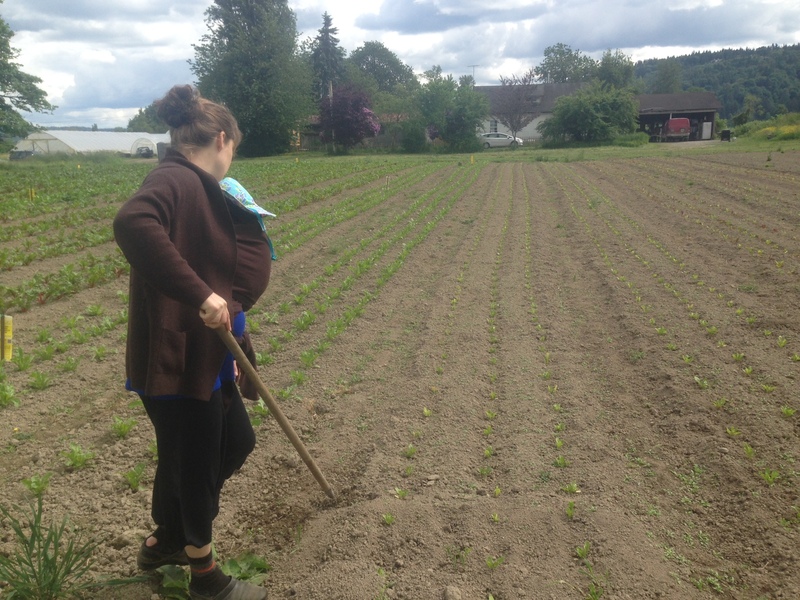 We came home from the hospital with our sweet new baby with only a month to go before the start of our CSA season. This is the time of year when I (Siri) have the most on my plate. Managing a 200 member CSA with 15 different pickup locations is a challenge even when I’m not responsible for the care and feeding of a helpless infant. This year has been a gratifying example of how things usually turn out just fine, even when I don’t apply my normal amount of scrupulous attention to detail! And doesn’t it look great!! 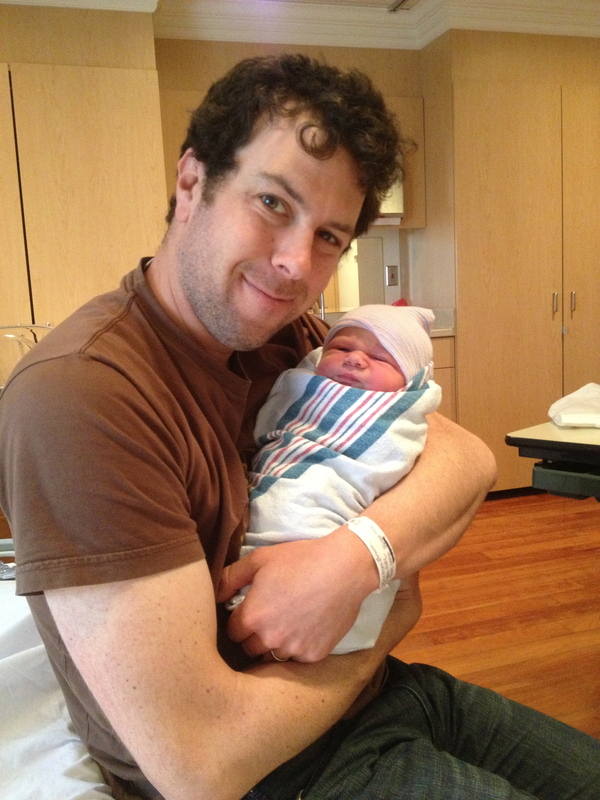 All in all, it’s been a pretty easy transition from a family of three to a family of four. It’s pretty busy around here these days, but we’ll do our best to squeeze in a blog post here whenever we can. Thanks for reading! The weather this spring has been pretty remarkable. Although we’ve had more rainfall in the February through April period than any year on record (19 inches and counting, including over 9 inches in March alone!) the rain has come in brief but intense periods. In the dry spells between, we’ve managed to stay right on track with our schedule of seeding and transplanting in the field. We’ve been aware of our soil’s capacity to drain and dry out since our first spring here, when we had a major flood on April 1st. One week after the floodwaters receded we were able to work ground that had been underwater and get seeds sown. We had already planned to incorporate long fallow periods into our rotational plan, and witnessing the natural drainage capability of our soil in that situation really reinforced our commitment to giving our fields a rest as often as possible. The activity of earthworms and other soil-dwelling animals, as well as invisible fungi and bacteria, serve to form soil particles into larger aggregates with lots of air pockets and tunnels running through. Frequent tillage breaks these aggregates into smaller pieces, which can only be restored by leaving the soil alone for a while. But I digress…. 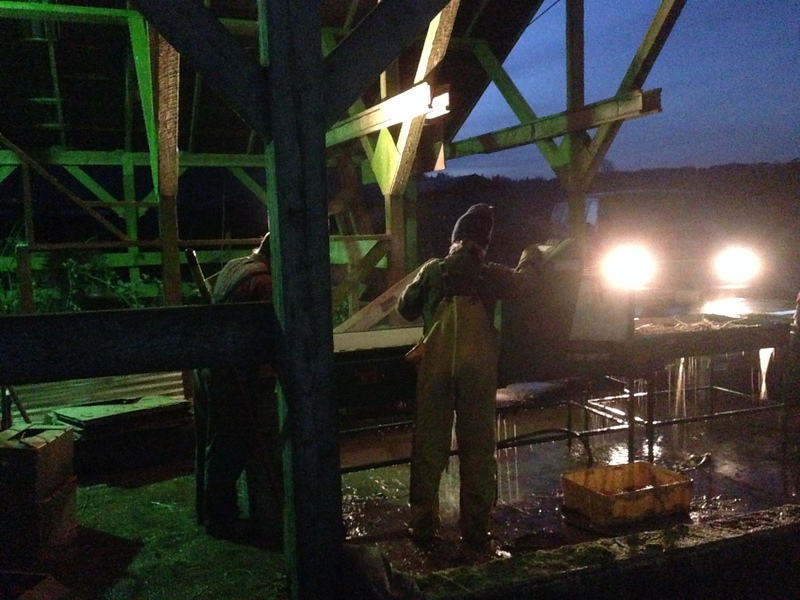 What I intended to write about is the hive of activity that is the farm in late April. 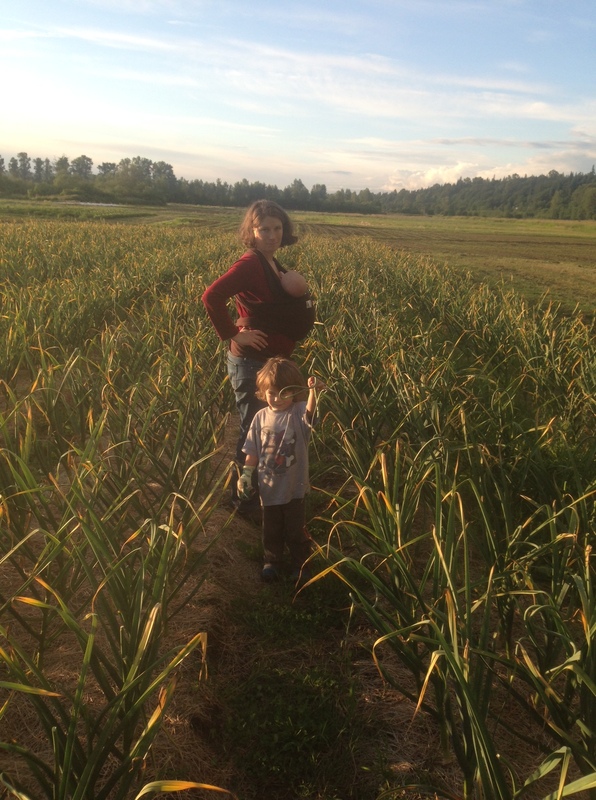 We are mid-way through our big onion planting – about 20,000 cippolini, shallot, and Duvalla Walla sweet onions. We succession plant leeks for harvest from late summer through deep winter, and some of those have already gone into the ground as well. 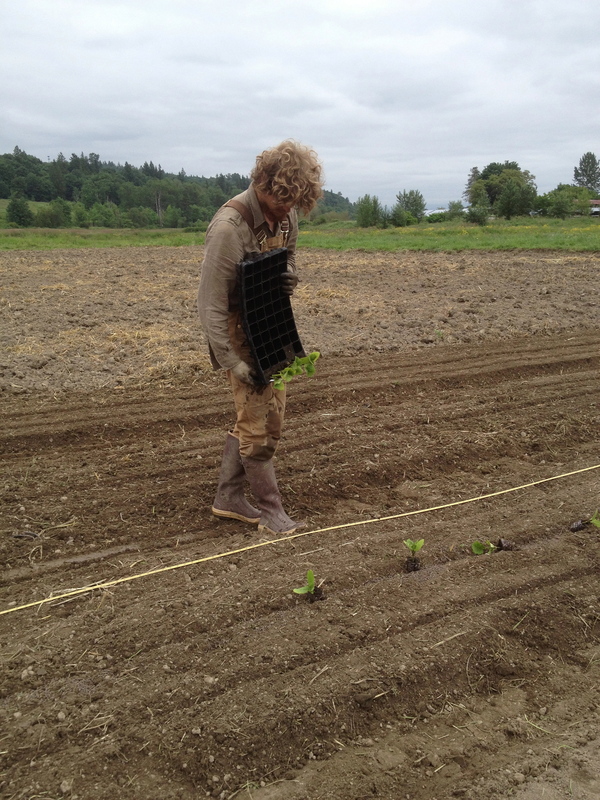 It’s important for us to get all our onion seedlings out of the greenhouse this week, because the first week of May is our scheduled seeding date for winter squash. We won’t have room for those trays of squash seedlings until the onions vacate! 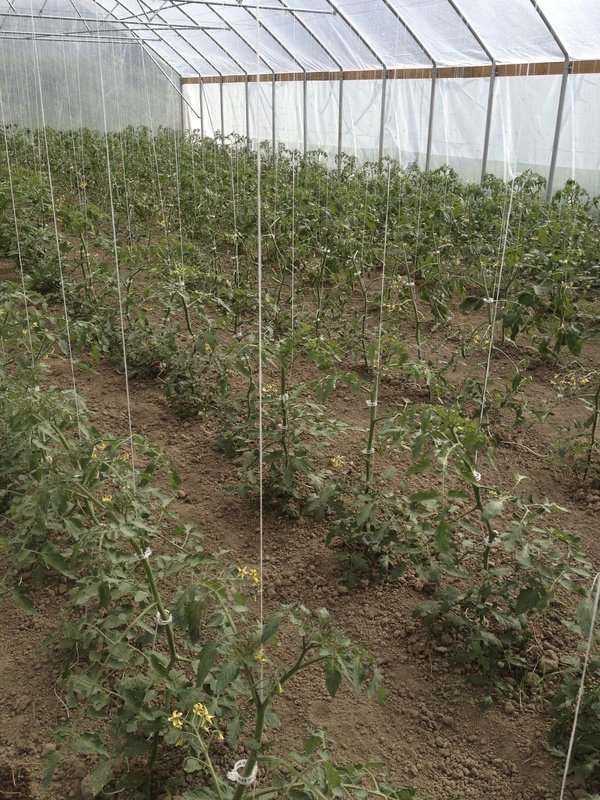 Another big one-time planting project is tomatoes. We are putting about 900 plants into two greenhouses today, with another 600 scheduled to go in another house in mid-May. This first round should get off to a great start, as temperatures are forecast in the low 80s this coming week. Once the plants are in and growing, we’ll soon start the ongoing pruning and trellising job that keeps the vines up in the air and off the ground. Last year’s tomatoes looking good. Of course, all our other crops continue to get planted out on a regular succession: lettuce every week, fennel and escarole every two weeks, chard every four weeks, broccoli, cabbage, and kohlrabi on a staggered succession to provide good diversity for the CSA and farmers markets this summer. It’s pretty amazing to check the seedling house these days – plants go from medium size to “get me in the ground” in about three days. 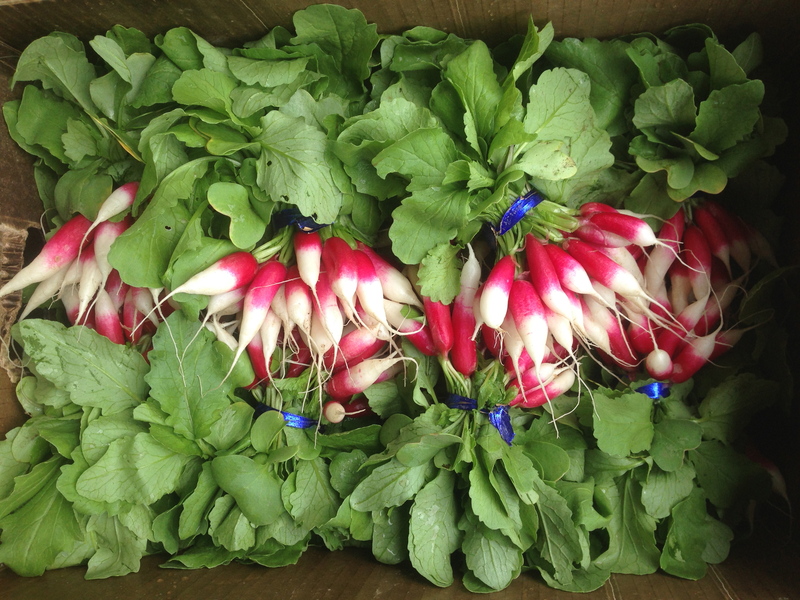 In non-planting news, we are getting ready for the start of farmers market season. Duvall opens this coming Thursday, May 1st. We’ll be back at the Broadway market on Mothers Day (May 11). 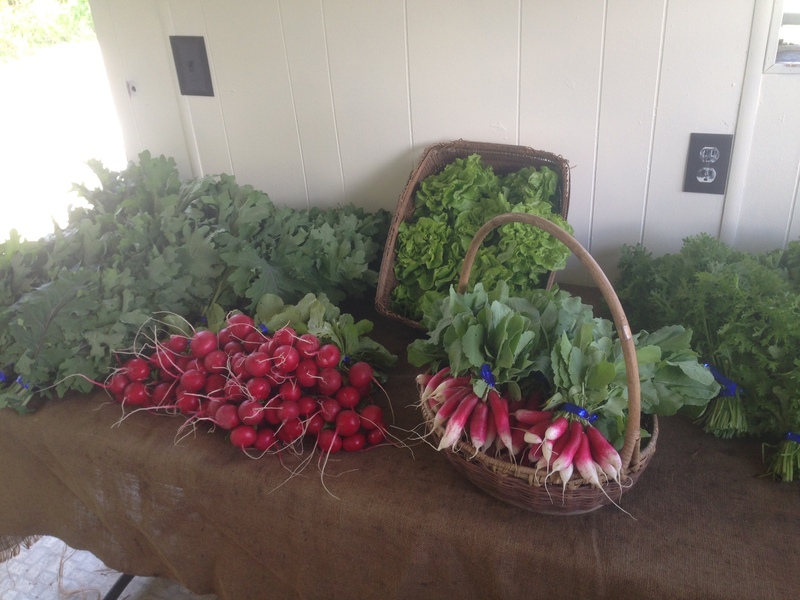 Today we hauled our little red farmstand caboose back up to its station at the end of our driveway, and it’s got a good spread of early spring produce: radishes, tender Red Russian kale, mustard greens, and baby lettuce. And that’s all the news from the farm this sunny and blustery Sunday. Stay tuned for more soon! Just like every other spring we’ve experienced since we started Local Roots Farm eight seasons ago, this one has been quite unusual. This March, we endured the wettest month in the PNW since November 2006. Usually, around here, November through January are when it rains the most, and the most often. Lately, we’ve noticed that the winters have been drier than normal and spring wetter. In addition to the unfortunate effect this has on the quality of the skiing, it also makes getting our year started a bit more difficult. 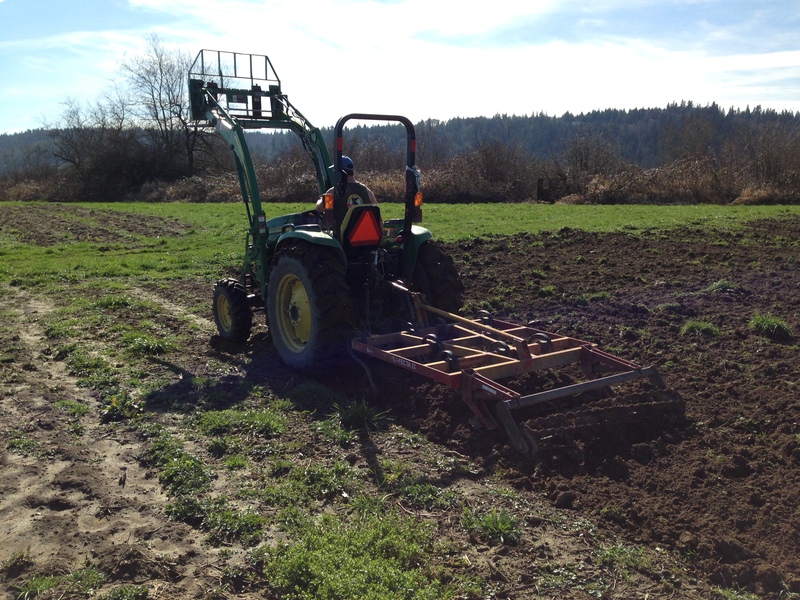 We end every year planting cover crops and we begin each spring turning those cover crops into the soil. But when the ground is wet, you can’t work it…. and so throughout March, we mostly waited. 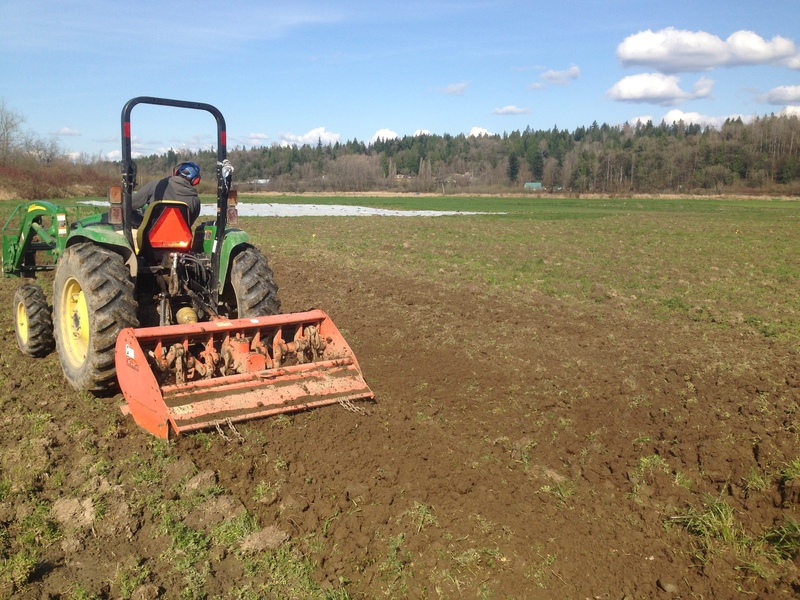 Thankfully, the weather gods were kind enough to us to provide a few opportunities to start turning fields of cover crops into fields of beds ready for seeds and transplants. 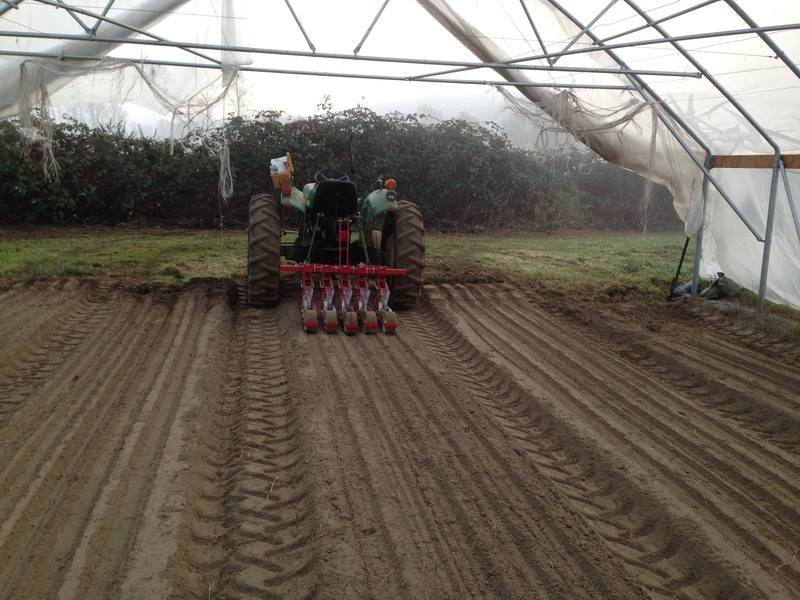 We have adopted a new regime for taking a field from cover crop to seed bed that we are very pleased with. After we flail mow, we are using a Perfecta II field cultivator as our initial tillage tool. We like the fact that you can work up a field pretty quickly with it, and the action of the tool seems to encourage drying. 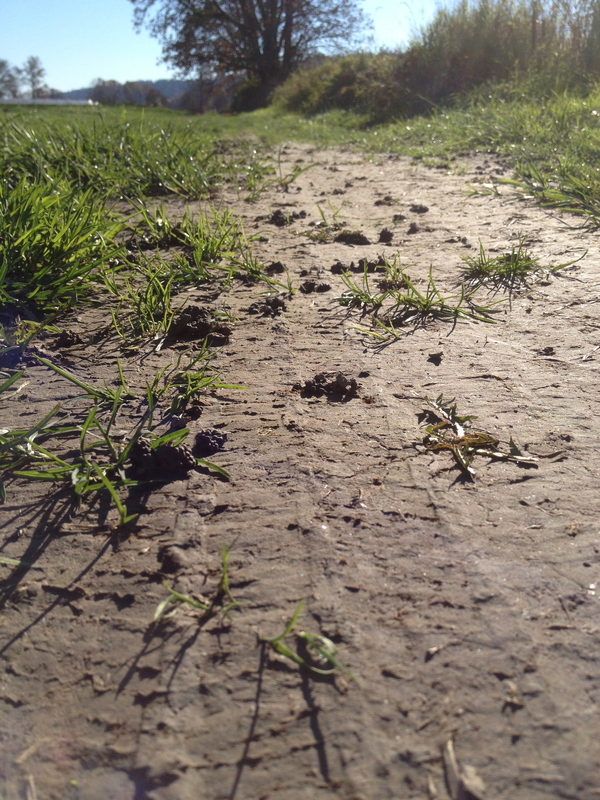 In prior years we’ve tried spading (slow and surprisingly ineffective), disking (neither of our disks is heavy enough to do an adequate job), and tilling (slow and bad for the soil). The results from the Perfecta have been great. It slices cover crops just below the soil, killing most of the plants, and it fluffs and aerates the top few inches, promoting drying. We follow the Perfecta with the spader. The spader works wonders when spading a field that’s already fairly clean. We like the spader because it works well when soil is damp, doesn’t require much horsepower or traction, tills deep, uncompacts the tire tracks, and doesn’t leave a hardpan below its working depth. The major drawback to the spader is that it’s very slow. 1 mph slow. It takes nearly three hours to spade an acre. But for early-season tillage, it’s probably the best tool out there because you can work a field earlier with the spader than most any other tool. For those of you following along at home, you know we had an exceptionally cold winter that killed off nearly all of our overwintering plants, leaving us with very little early season produce to sell. 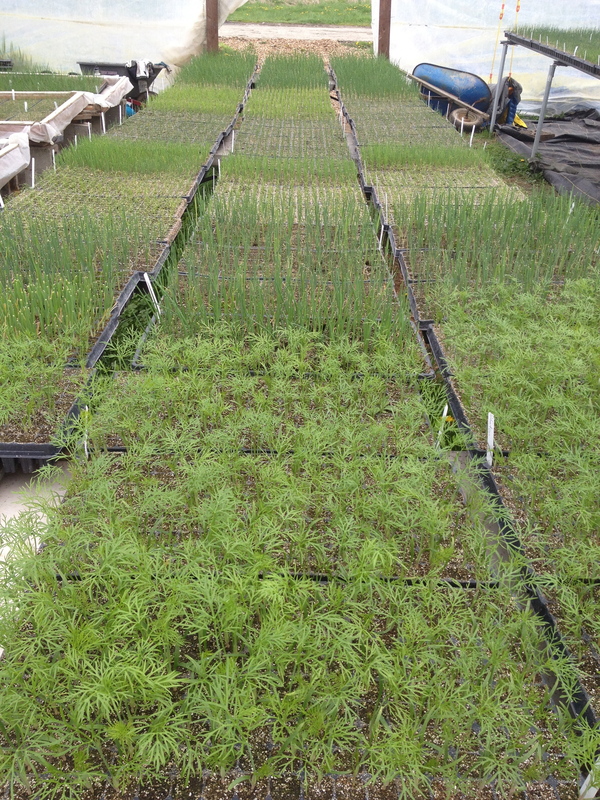 We have planted nearly all of our greenhouses to fast-growing arugula, radishes, turnips, and baby lettuce…. 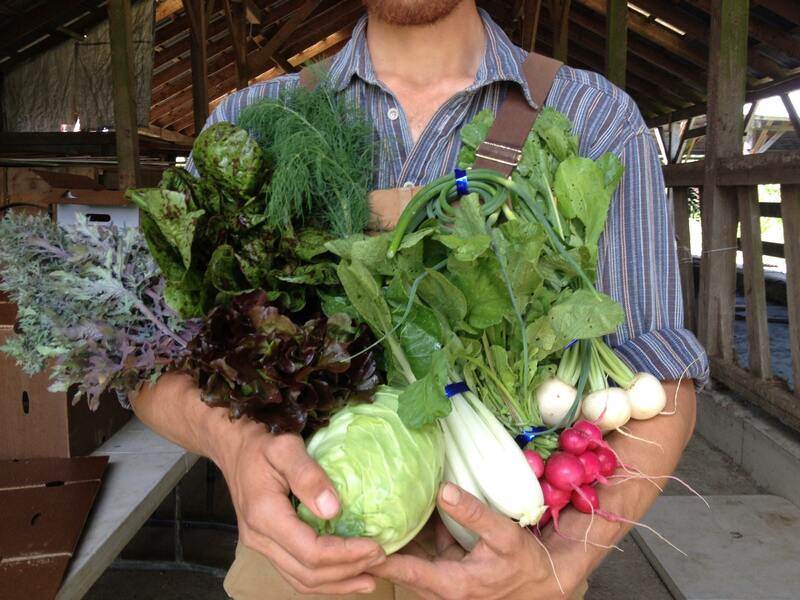 and 100% of what we’ve been harvesting has been going to our favorite restaurants around Seattle. When, then, will we return to the farmers markets? A good question. We have just started harvesting from the first succession of direct-seeded beds planted outdoors. We are just beginning to see the first trickle of that bounty starting to flow in. 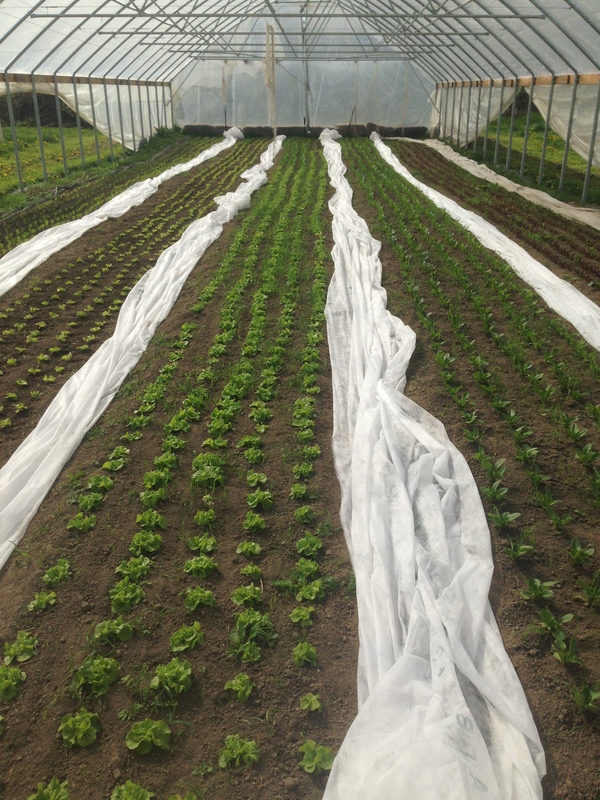 We also have a good amount of lettuce and kale lying in wait, ready for us to begin markets again. If this were an ordinary year, we would have probably started vending at the Broadway Market already… but it’s not. Siri and I are expecting our second child in less than a week and we’ve decided to hold off on farmers markets until we’ve gotten over that hurdle. Right now, we are aiming for May 11th to be our first market of the year. Come see us, and say hello to the newest addition to the farm! Since our very first year farming, we’ve had help on the farm in the form of apprentices. In the beginning, we were pretty much making this farming thing up as we went, and our apprentices learned right along with us, getting the opportunity to see all the struggles and puzzlement that went into figuring out how to get plants to grow and then how to get people to buy them. 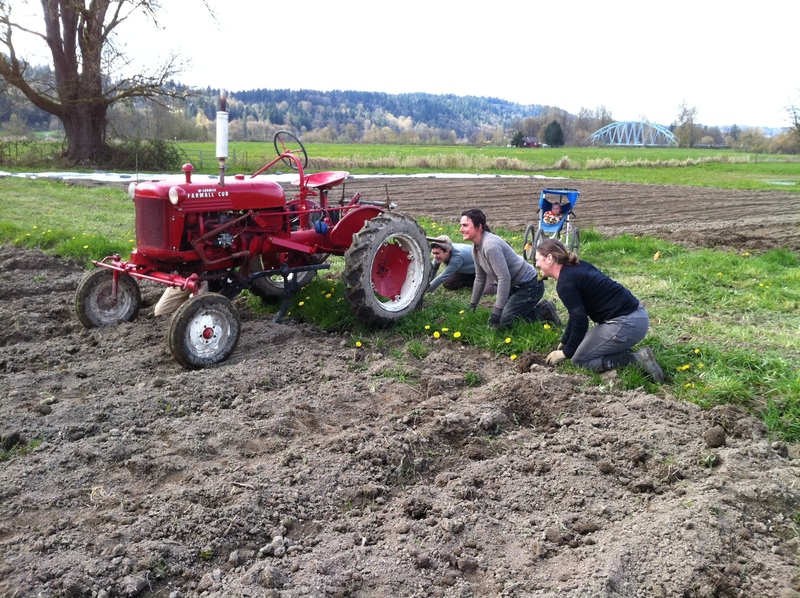 Marisa, Rita, and Leah learning about cultivating with our vintage Farmall Cub. Over the years, our farm workforce has evolved. 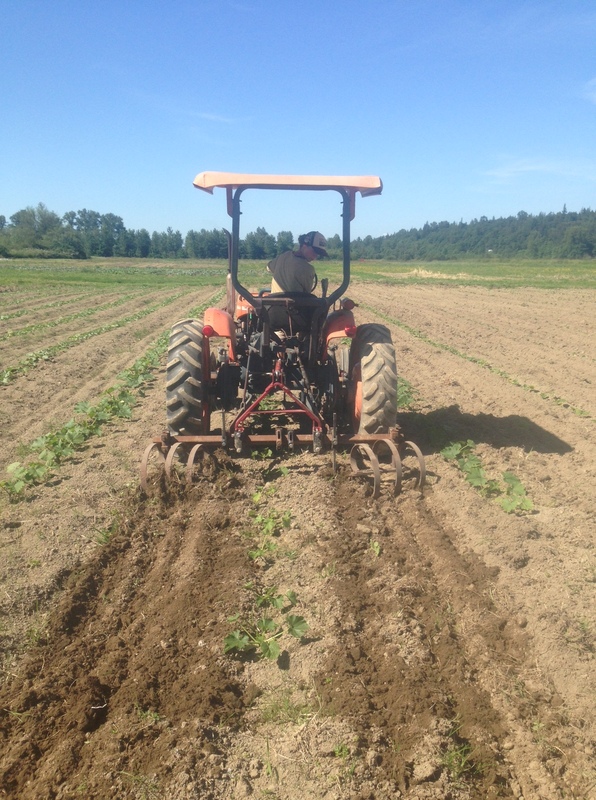 We still hire a group of mostly novice farmers each year, but we also have a crew of experienced workers who know our farm systems and can be entrusted with a lot of the day-to-day management of the farm. For me and Jason, providing an entry point into a farming career for people without previous experience is very important. We, and most of the farmers we know, got our start working as apprentices or interns on other farms. It’s a system that I sometimes jokingly refer to as the “apprentice pyramid scheme,” but in reality, it is the most consistent and effective means for a would-be farmer to learn the practical skills needed to start his or her own farm. Our own farm has now grown to the point where we need several experienced veteran managers and crew leaders to get all the work done, but we also recognize that everyone has to start at the beginning somehow. Kyli and Rawley bunching kale. Whether our “alumni” go on to careers in farming or take another path in life, their experiences with us inevitably shape the way they think and interact with the world. Farming, from the outside, may look like a series of mindless drudgery tasks, but in fact each job that we do takes skill and training. Farmers and farm workers learn to look at a problem or a task, weigh the possible solutions, evaluate their own capability to alter the situation, and take the appropriate actions. 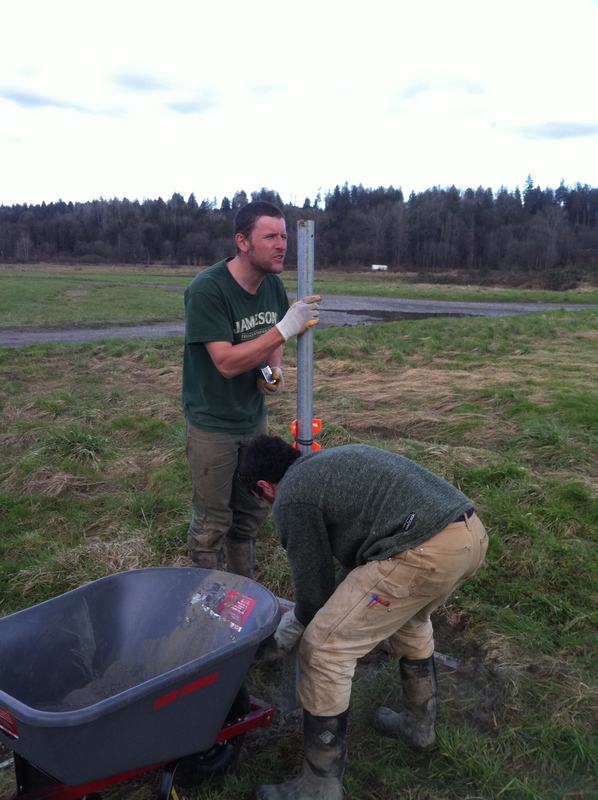 Brady and Jason setting posts on our seedling greenhouse. A farmer I know classified people as those who are “able to change the corporeal world” and those who are not. In today’s world there are fewer and fewer people who have the skills and self-confidence to change the corporeal world, yet many of our greatest challenges as a culture require us to think of novel ways to interact with that world in new and challenging ways. We need to think differently about how we manage water, how we build the environment where we live, how we manage natural resources of all kinds. People who have spent time on diversified farms are well equipped to combine practical knowledge and intellectual rigor to solve this type of problem. The world needs more farmers. We’re working on it! Our standout class of 2012. 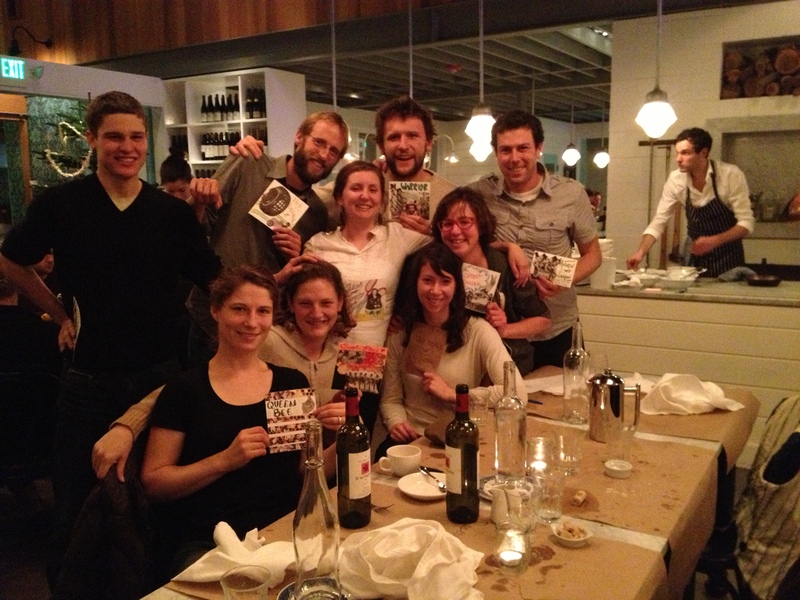 All these folks still work at Local Roots or run their own farms. And Cara. 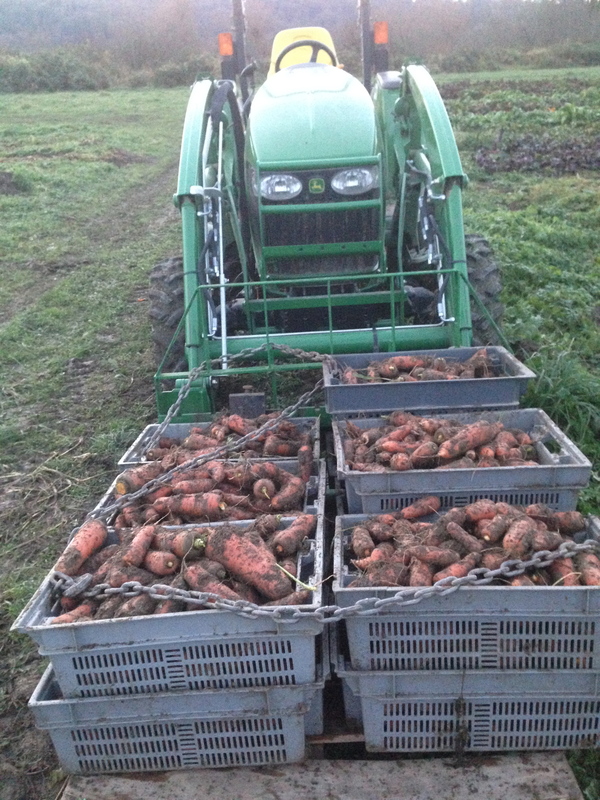 We also had a very cold spell (single digits) back in December, which put an end to our harvest of most field crops. Kale, cabbage, chard, and Brussels sprouts all froze back, and while some of the plants didn’t die altogether, their edible-size leaves all fell off and they have yet to put on any new growth. 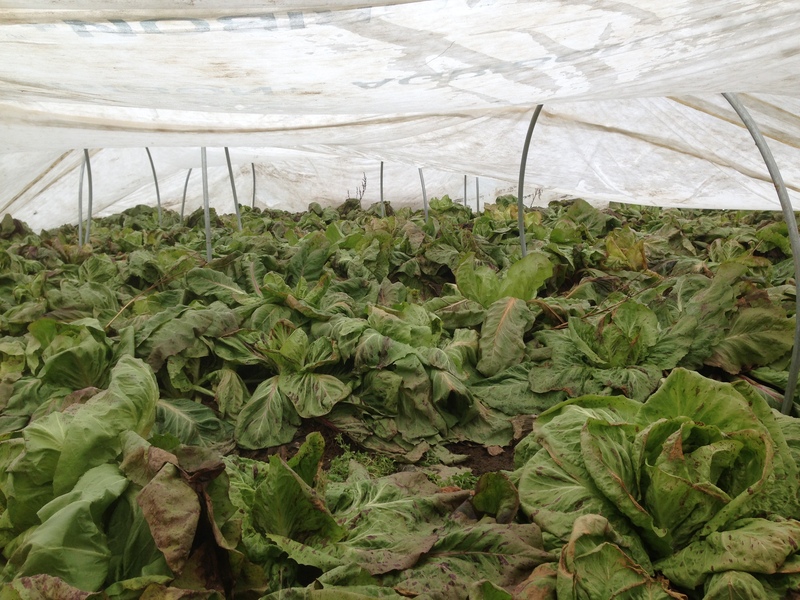 We went to great trouble to cover our mostly-untouched beds of radicchio with multiple layers of row-cover, held up off the plants with an army of little low hoops. This strategy worked very well, and we will probably do more of this type of protection in future years’ cold snaps. Unprotected leeks and parsnips came through the freeze mostly undamaged, but the one remaining bed of carrots that we left in the field before the December freeze were damaged enough that the roots are now rotting from the top down. 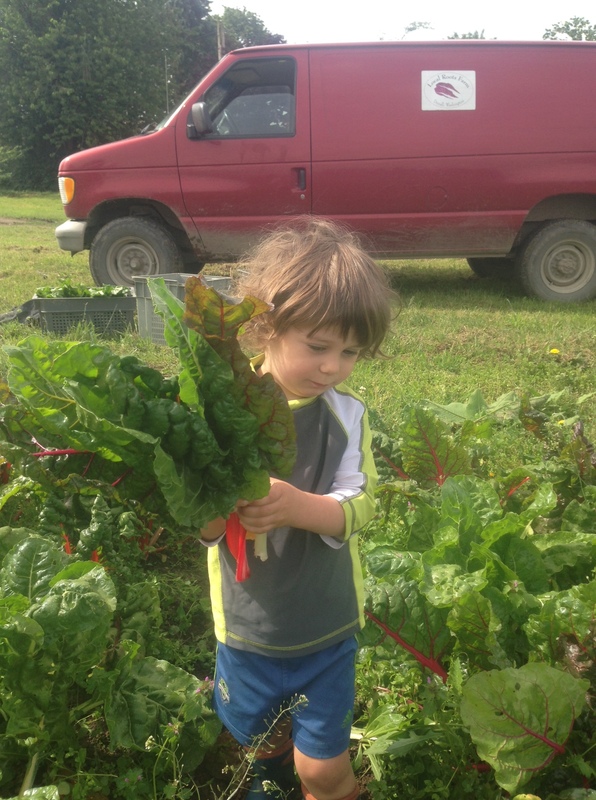 Last winter, by comparison, we continued to harvest fresh leafy greens from the field almost every week of the winter. Our kale put out a slow but continuous supply of new leaves from the fall all the way through the early spring, when they transitioned to producing tender and delicious flower stalks – kale “rapini.” We left many beds of carrots in the field, and harvested them fresh throughout the winter. We had so much produce on our hands, in fact, that we staged a “rogue market” at our Sunday farmers market site after the market closed in December. 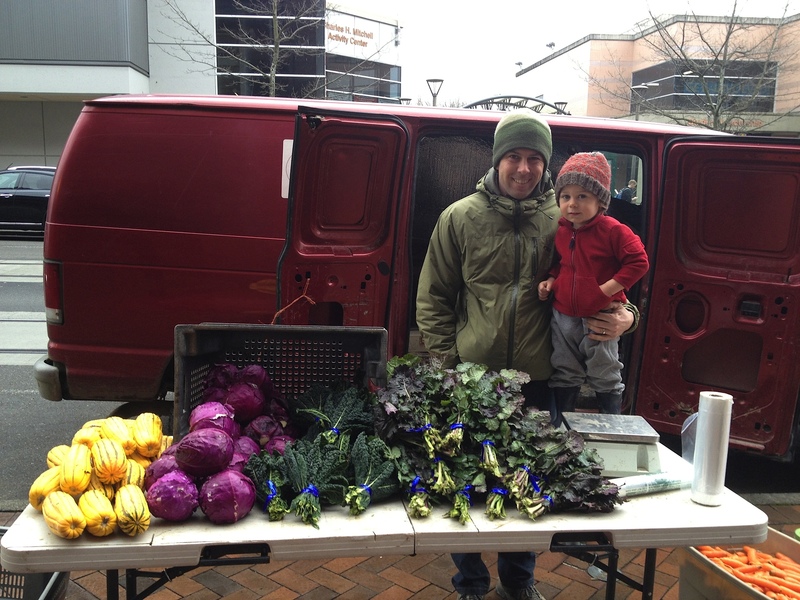 Every other week in January and February we packed up our van with carrots, beets, squash, parsnips, and an assortment of bunched greens, and set up shop on the sidewalk where the market usually is. Our efforts inspired the market management to extend the market to a year-round affair… only to have this unusually cold weather take a lot of farms’ winter crops out of commission. 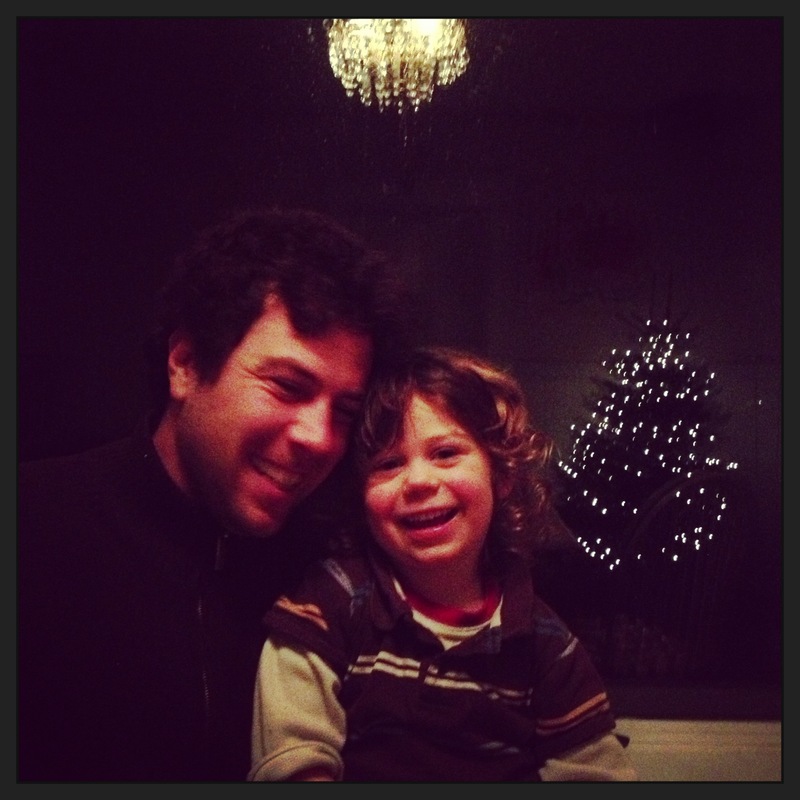 Felix & Jason at our “rogue market” last winter. How we miss those greens now! So, where are we now? 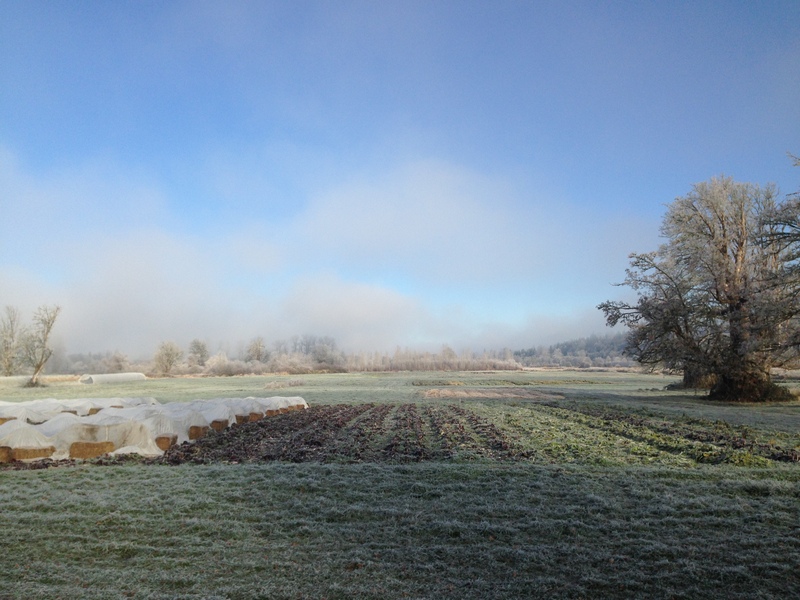 Down to the dregs of our stored root crops, nothing green to eat in the field, and no early season re-growth of greens in sight, what with this frigid weather. We do have some experimental arugula and radishes bravely growing under row cover in one of our 30×90 greenhouses – sowed after the December cold, so we’ll see what it looks like after this week. We also have our small grow-light setup fully occupied with a combination of lettuce, onions, artichokes, and an assortment of herbs. We usually start our first onions and shallots from seed in late January or early February, giving them a little time in the artificial heat and light of the grow room before moving them into the unheated greenhouse. We are about 50 flats over capacity in our grow room, so we have arranged a makeshift enclosure to provide the plants in our greenhouse with a little extra heat to help them survive the next few nights. If they don’t make it, it’s certainly not too late to start a round of replacements… but we’d rather not re-seed 10,000 onions. After a mad rush to get all our remaining storage crops harvested before the Great Freeze of December 2013, promptly followed by the departures (some temporary, some for good) of our remaining work crew, Jason and I had a chance to rest, celebrate, and turn our thoughts to the upcoming farming season. 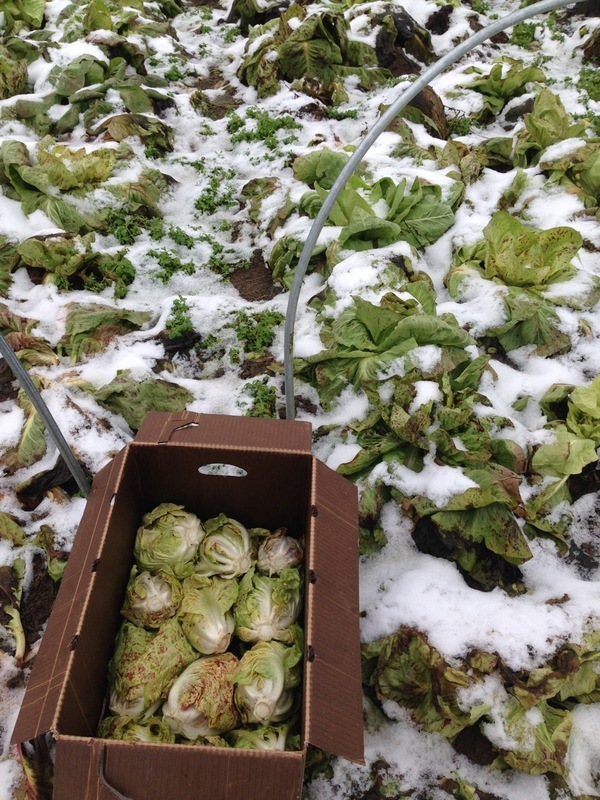 The single-digit weather caused significant damage to most of the crops we left in the field (kale, chard, parsley) and those things that did survive (radicchio, leeks) were quickly snapped up by our restaurant and market customers in the run-up to the holidays. We are now down to just a handful of storage crops: carrots, parsnips, Delicata squash, and a few boxes of shallots. We’ll continue to attend the Broadway market during January, but once we run out of stored produce we will have to wait for regrowth of our field crops before we’ll have anything to sell. In a way, a break in the weekly routine of market and deliveries will be very welcome. We haven’t taken a week off from making restaurant deliveries since March of 2012 – that’s 22 months straight! We had hoped to grow and harvest enough storage crops to make a showing at the Broadway market all the way through the 2013/14 winter, and were a bit surprised by how quickly we sold out of most things. That, combined with the colder-than-normal December weather, has left our cupboards and fields quite bare at the moment. Now we get the chance to spend February and March catching up on some long-deferred cleaning and building projects: beating back the ever encroaching blackberries that grow in all our fence lines, purging our farm shop of all junk and clutter, building a couple new 12’x130′ hoophouses, and continuing to fix up our old farmhouse(s). Of course, there’s lots of other work that Jason and I do during the winter months. We have completed this year’s crop plan and are now in the process of calculating how much of each variety of seed we need and placing orders. While it’s always fun to peruse the seed catalogs and see what’s new, after seven years of vegetable growing, we now have our go-to varieties for most of the crops we grow. We make our crop plan in concert with our annual budget. If we plan to increase sales, that means we also have to figure out what we will sell… which means figuring out what to grow more of. When we plan for increases in the size of our CSA, we have to make small across-the-board increases in the acreage devoted to each crop. If we hope to grow our restaurant sales, we may focus on planting more of just a couple crops that restaurant customers particularly like. 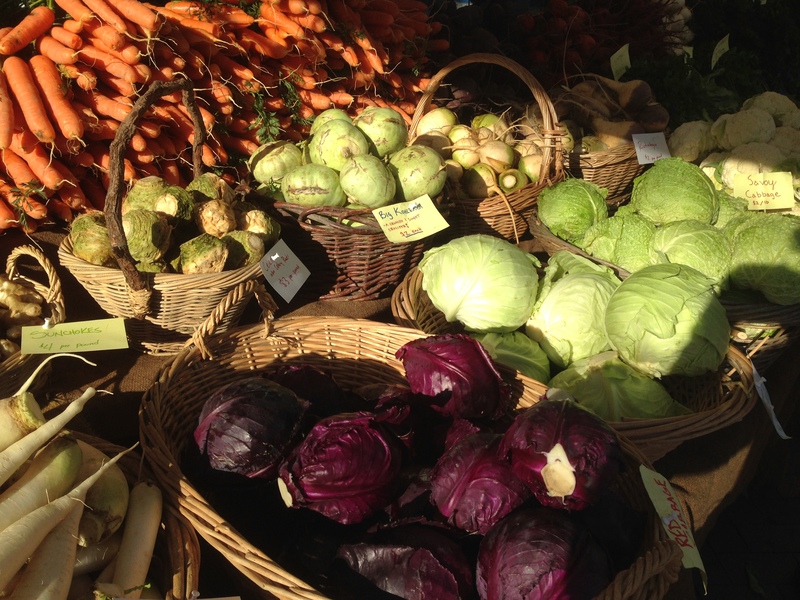 Last year we bumped up our Brussels sprout, radicchio, and leek crops, all with good results. Next year we are considering adding to our onion and kale plantings. 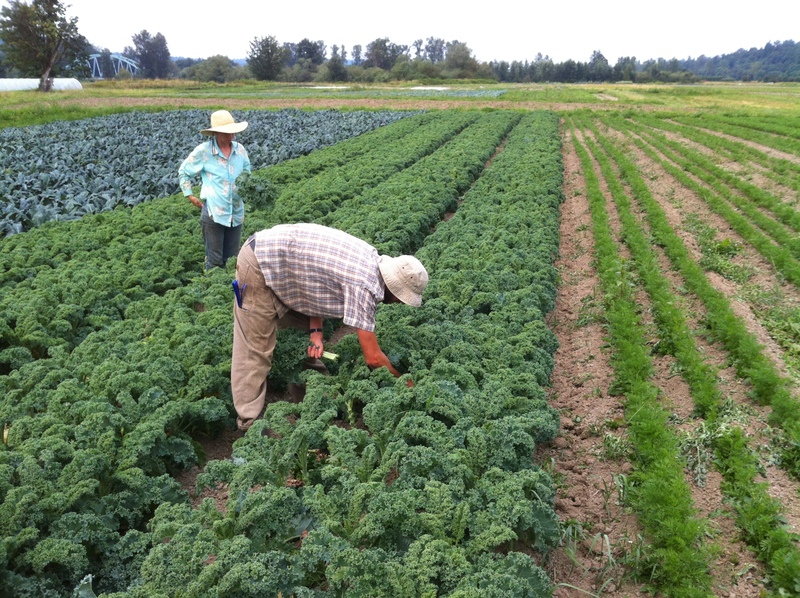 Each of these decisions ripples across our farm plan in many ways: Where will we plant the additional kale? Do we need to adjust our long-term rotation plan? Will we need extra labor for the planting and harvesting? 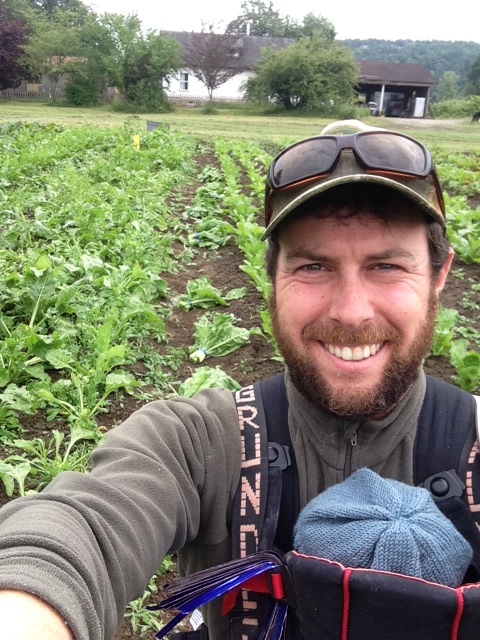 Our farm operation has grown so gradually – just an acre or two more each year – that we’ve always been able to add to our crew and our marketing plan “organically”, rather than using a formula about the ratio of crew size to acreage. 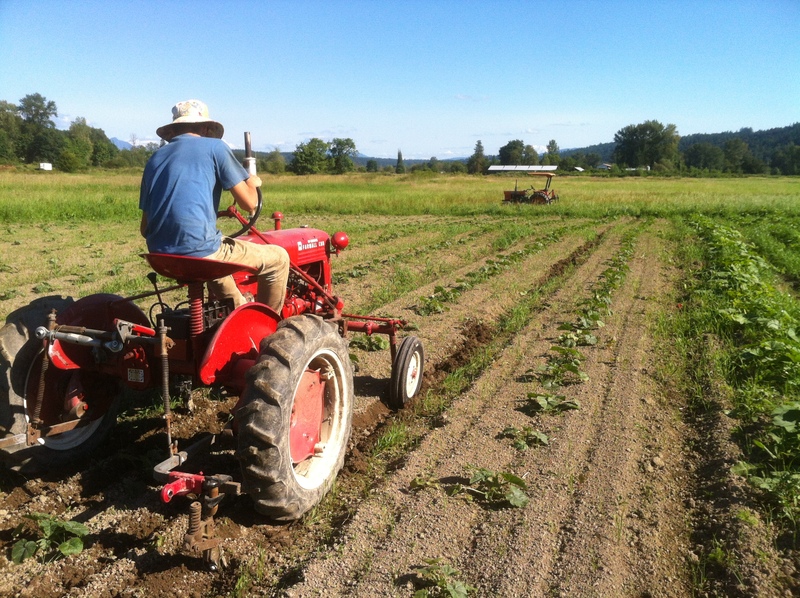 One change we are planning to make to our crew this year is to hire on extra help just during a few specific times of year, like when squash transplanting coincides with the start of our CSA in early June, or in October when we are trying to get thousands of pounds of roots harvested, washed, and stored for the winter. Right now is when we have the time to think about and plan for all these things… before we begin the real work of 2014, but before we forget all the lessons of 2013. It’s bloody cold out here. Thursday night the thermometer hit 10 degrees. It hasn’t been above freezing for a week. Despite leaving water running 24/7 in our kitchen sink, our pipes still froze. Drat. The good news is that with sunny days, the kale and radicchio and other veggies still in the field do stand a chance of making it through this Arctic weather. We spent all last week harvesting like crazy, trying to bring in as much as possible to store in the coolers before the mercury dropped. Even with our nifty bed lifter and root washer, we quickly realized that we wouldn’t have time to harvest and wash all our roots. So we quit washing them about half-way through and now have boxes upon boxes of unwashed carrots and beets and such in our coolers. We managed to finish the week with somewhere in the neighborhood of 4000 lbs of roots, 1000 heads of radicchio, and heaps of other assorted veggies in the coolers. We already had lots of squash put away, so we feel ready and able to meet this year’s newest challenge, the year-round Broadway Farmers Market. Every year, we are always strategizing about how to do a better job, how to grow our business in the most effective ways. We make the vast majority of our income between July and October. That’s five months in which we make 75% of our gross revenue. It’s those five months that make the rest of the year so crazy. The change we decided to implement this year was to grow more storage crops, in an attempt to flatten that income curve somewhat. It was a huge undertaking and a substantial investment infrastructure to bring in all that produce and have a relatively secure place to keep it all, and it took that looming Arctic cold front to force us to bring it all in. But now we are sitting on a lot of wonderful storage vegetables – tons of winter squash, four varieties of carrots, beets, parsnips, parsley root, rutabaga, Gilfeather turnips, celery root, daikon, leeks, Brussels sprouts, three types of cabbage, and three types of radicchio. 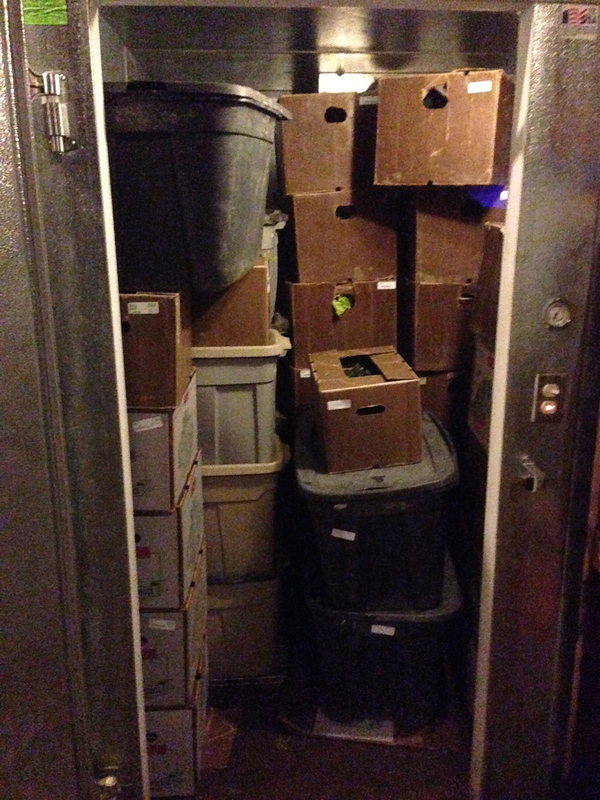 Our plan to grow and store enough produce to make it through a winter’s worth of markets was a success…. now we’ll see how long they store in the coolers and how quickly we can sell them.